It was a busy Q3 2017 for Kinseth Hospitality Companies. We welcomed two new faces to our corporate team, hosted several grand openings, and broke ground on a new Marriott hotel in Marion, Iowa. 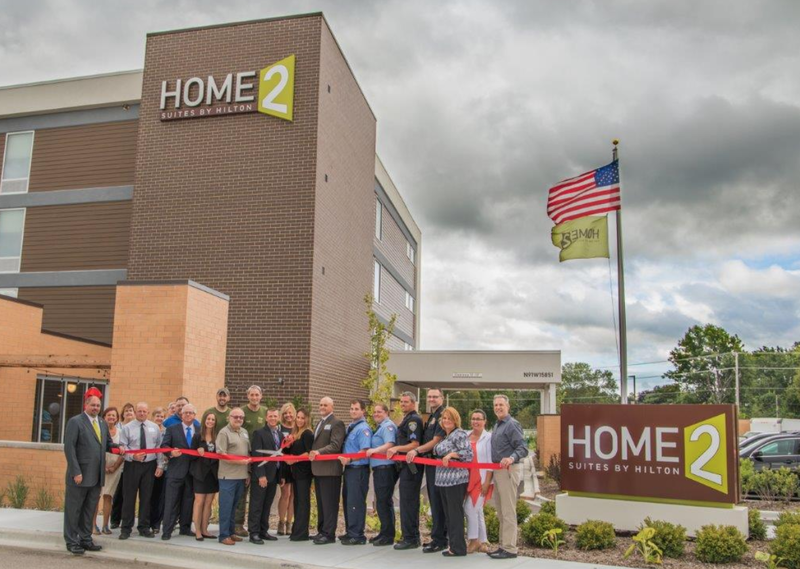 Kinseth Celebrates Home2 Suites Menomonee Falls Grand Opening & Ribbon Cutting Ceremony! The official ribbon cutting ceremony and grand opening celebration of the Home2 Suites by Hilton in Menomonee Falls, Wisconsin took place on August 17, 2017. With over 150 guests in attendance Toni Gumina Yates, Executive Director of Menomonee Falls Chamber of Commerce, and Jeff Schrader, Director of New Business of Kinseth Hospitality Companies, shared their excitement about the opening of the Home2 Suites by Hilton hotel. The hotel is located at N91 W15851 Falls Parkway, Menomonee Falls, WI just 20 minutes northeast of Milwaukee. Kinseth Celebrates Grand Opening & Ribbon Cutting of The Fourth Tru By Hilton Nationwide! 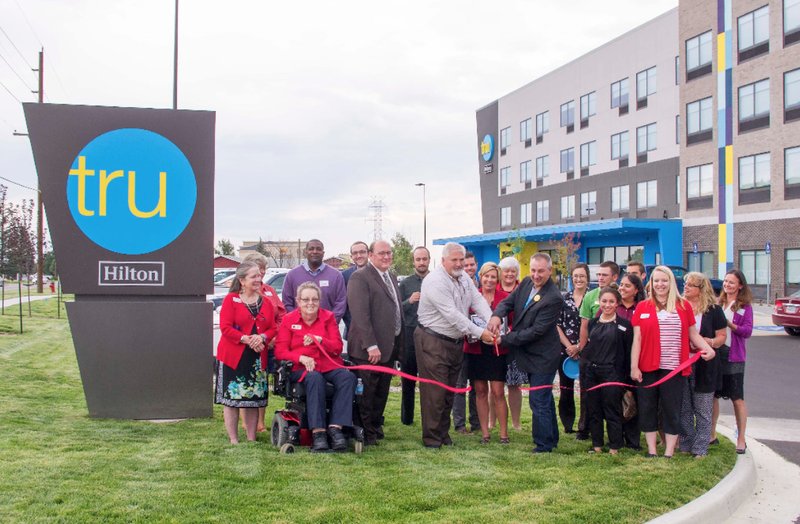 Kinseth Hospitality Companies is pleased to announce the official ribbon cutting ceremony and grand opening celebration of the Tru by Hilton Cheyenne, Wyoming took place on August 25, 2017. According to Gary Kinseth, “We’re excited to bring Tru to Cheyenne, this is the fourth Tru to open in the country. . . We think [Tru] is going to be one of the fastest growing brands in history not only for Hilton but for the whole industry.” Congrats to Mark and his time on the great turn-out of over 200 guests in attendance! Kinseth Welcomes Connie Schlichting as Director of Operations! 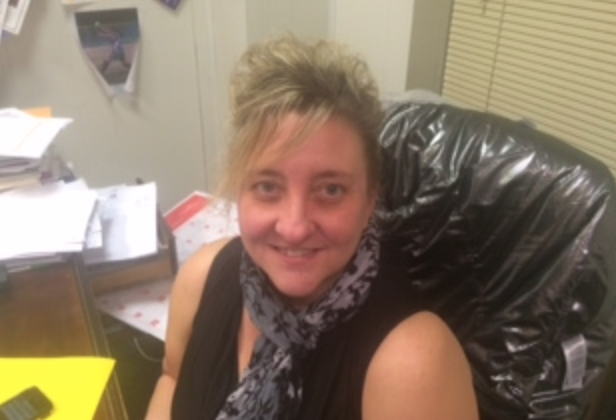 Kinseth would like to welcome Connie Schlichting to the team of Director of Operations. Connie has been with the company for many many years most recently as the General Manager of the Hilton Garden Inn Bettendorf. She will be the director of operations for the Quad Cities / Iowa City Region. Congrats Connie and thank you for all you do! Kinseth Welcomes Brian Wessels As Our New Corporate Controller! 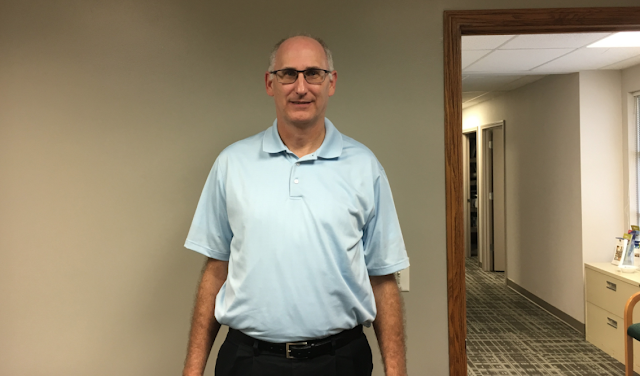 Kinseth would like to welcome Brian Wessels to our management team. Brian started with Kinseth September 5th, and jumped right in! He brings a wealth of experience and is coming to us after a long run with Prairie Meadows Casino & Hotel in Des Moines. Please help us welcome Brain to the team! 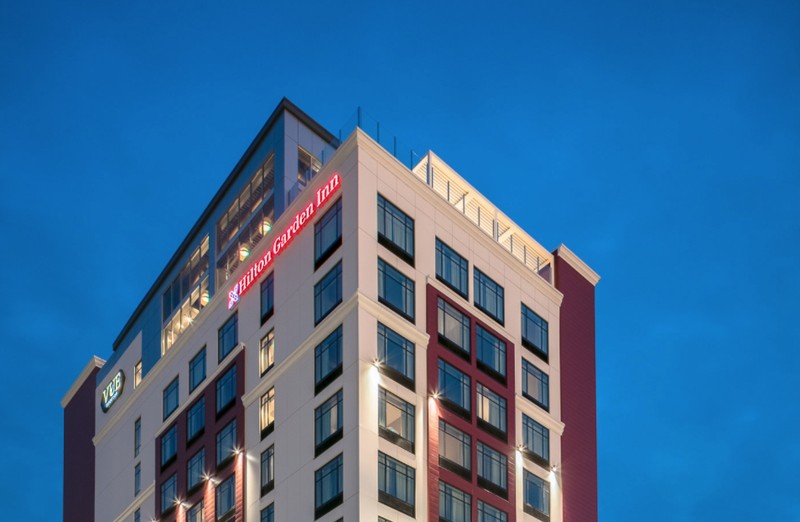 Kinseth Opens Hilton Garden Inn Iowa City! On October 5th, 2017 Kinseth officially opened the doors of the twelve story Hilton Garden inn hotel. The hotel sits in the Downtown District of Iowa City just across the street from the University of Iowa's School of Music. General Manger Neal Roth and his team couldn't be more excited to be serving the city of Iowa City. Please help us in wishing them congratulations! 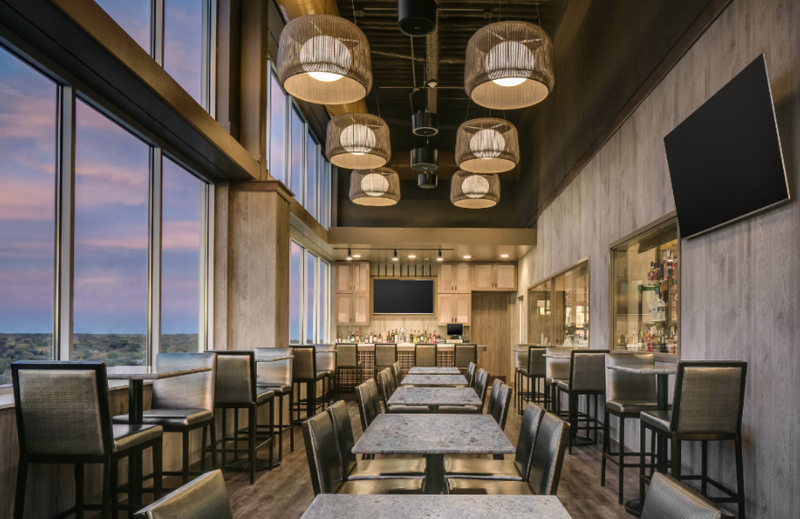 On October 24th Kinseth opened up their newest independent restaurant Vue Rooftop to the public! The restaurant sits of the twelfth floor of the Hilton Garden Inn Iowa City and offers one of a kind views of downtown Iowa City. The restaurant features an outside patio space with firepit, inside dining space, and a private event space! 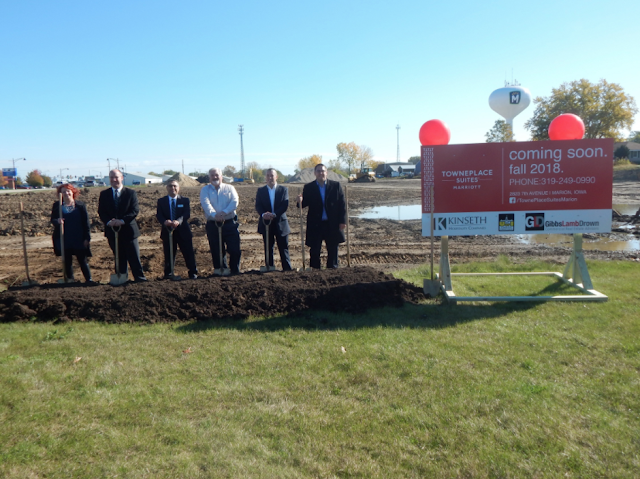 Kinseth Breaks Ground on TownePlace Suites in Marion, Iowa. Wednesday October 25th, Kinseth held a groundbreaking ceremony at the site of the future TownePlace Suites Marion. The extended stay Marriott hotel will be a great addition to the Greater Cedar Rapids area and the Marion city officials couldn't be more excited about the coming hotel. To see the whole event see our Facebook Live Video! Candlewood Suites Kenosha - teamed up with Big Brother Big Sister of Racine & Kenosha Countries to host "Fast Cars & Movies"! They had "Bigs & Littles" come out to the hotel to check out race cars, then they were able to relax in the meeting room while watching Cars 2! The turn out was awesome, the community support was amazing, and seeing the kids happy was priceless! Courtyard Columbia - was in the path of totality for the Total Solar Eclipse and hosted an eclipse party including fire performers. The Marriott MLive team attended and was filming the event! Hampton Inn & Suites Kenosha - celebrated National Waffle Day! They offered a special waffle bar for all our guest, and invited their clients! Being able to have their clients in the hotel and having them experience our breakfast first hand, was a WIN for team Kenosha! Hampton Inn & Suites West Bend - hosted a Back to School Bash for Big Brothers Big Sisters and the kids LOVED it! They had a popcorn bar (the popcorn was donated from a partner), showed the kids a movie, offered board games , and threw down blankets and pillows. Most of the kids came in their pajamas and brought their stuffed animals. It was SO much fun! Candlewood Suites La Crosse - held a luncheon for their Local Heroes. The La Crosse Police, Firefighters and First Responders were invited to the hotel from 11am-2pm to enjoy brats and burgers cooked on our outdoor grills and patio along with potato salad, beans and soft drinks. Staff had a chance to meet and greet and thank our Local Heroes for all they do for us. They took leftovers to the Police Station for officers who could not make it to the hotel. They really appreciated us thanking them and thinking of them on this day after the anniversary of 9/11! Hampton Inn & Suites Grafton - sponsored a hole at a local Chamber Golf Outing. They had a BLAST! They setup a small photo booth, and then had a prize wheel where every spin would win! The teams said our booth was the most fun hole there! They also hosted their first heroes dinner for all first responders in our county. The turnout was good, and everyone had a great time with the photo board and winning raffle prizes. Texas Roadhouse donated all of the food, and the community came together very nicely to donate raffle prizes. Home2 Suites Brookfield - hosted our first Hero's Luncheon. They had the Town of Brookfield Fire department and Police department and had donated gift baskets from a few local companies. Texas Roadhouse donated lunch. The Ankeny Diner - attended the Taste of Ankeny event and it was a huge success. Everyone loved the Chili and Shakes! Fairfield Inn & Suites Wichita - Celebrated Fairfield's 30th Anniversary with the staff and guests and volunteered our services at the Local Habitat for Humanity Restore in support of Fairfield's National Rally Day as well as Rally to Serve. Homewood Suites Ankeny - participated in the Des Moines Marathon promoting the Hotel and Team Spirit. This Marathon is one of the largest Community Charity Events providing support to the Mercy Foundation, Shoes that Fit & Children's Cancer Connection & many more! They had walkers and runners in the 5k, Half Marathon and Full Marathon. Hampton Inn & Suites Grafton & West Bend - hosted an Annual Big Brothers Big Sisters Halloween Bash, their favorite event of the year! The kids came dressed in costume, a local pumpkin farm donated pumpkins for the kids to decorate, a local pizza place donated pizzas, and we provide the decorated space. Such a great event and a wonderful way to get the community involved! Hampton Inn & Suites Hudson - hosted aHalloween party for guests and staff including their own haunted hotel room. It was a great time! Ramada Grand Dakota - received the Proud Blue Hawk Supporter Award for publicly displaying & promoting Blue Hawk Pride for Dickinson State University in the Community! Hilton Garden Inn Manhattan - hosted a pumpkin decorating contest with each of the departments pitted against each other. Competition was tight as guests and staff voted. Maintenance Team won with their Haunted House Pumpkin! Holiday Inn & Suites Overland Park - showed its creative side to benefit The Give Kids the World Foundation. The Hotel is engaged in a Penny War with the theme of Halloween/Fall for the decorations of the Bowls. The Hotel is separated into 5 Teams, Sales & Admin, Front Desk, Green Mill, Housekeeping & Maintenance, and Banquets & Kitchen. The competition is fierce but fun and it is all for a great cause.